MasonrySaver Paver Sealer can be used on most types of horizontal, above-grade concrete applications including: clay brick, clay paver stones, cements paver stones, and natural stone. MasonrySaver Paver Sealer provides protection from both water and the ultra-violet light of the sun. It can be used on most types of horizontal, above grade concrete applications including clay brick, clay paver stones and natural stone. For surfaces that receive heavy tire traffic, such as driveways and concrete sidewalks, the use of DEFY All-Purpose Heavy Duty Water Repellent might be preferred, as it does not form a film on the surface that can be worn off. DEFY Epoxy Fortified Paver Sealer is formulated with special, heavy duty resins and mildewcides, that help to reduce the occurance of fungus while also encapsulating the joint sand to retard the infiltration of ant colonies. It is also a paver sand sealer which helps keep patios cleaner by stabilizing the joint sand, bonding it firmly in place, and helping to keep the sand from washing out during periods of heavy rain as well as helping to reduce weeds from growing up through the joint sand. When properly applied, Defy Epoxy Fortified Paver Sealer enhances the beauty of any paver with a rich wet look without causing the surface to become slippery. 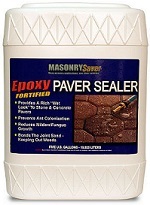 DEFY Epoxy Fortified Paver Sealer is available in 1 and 5 gallon recyclable plastic containers. When using on Cement pavers, the coverage rate is 75-150 square feet per gallon per coat, and 150-200 square feet for clay pavers. From Linda of Laurel Hill, Florida on 4/15/2019 . From Florida Joe of Tamps, Florida on 10/13/2016 . From Larry Walker of Brooksville, Florida on 3/15/2015 . From Anonymous of Orlando, Florida on 2/19/2015 . From Miller of Chicago, Illinois on 10/14/2013 . Duval Paint & Decorating, Inc.
Get the latest news on specialty paints & product deals!